Tough formula, copes easily with the heaviest industrial grime. Polyethylene beads for thorough yet gentle cleaning action. Contains no harsh chemicals – formulated to be kind to the skin. Easy to use: Easy to apply: Easy to rinse off. 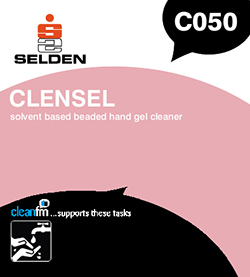 Clensel is suitable for use in all engineering shops, vehicle repairers, factories etc. wherever hands are soiled with industrial grime and grease. Composition A blend of alphatic petroleum based distillate, non-ionic and anionic surfactants, perfume, dye, preservative and polyethylene beads for enhanced product performance.